The Mythic Battles: Pantheon kickstarter project – the fantasy skirmish boardgame based on ancient Greek mythology – is entering it’s last 48 hours, which is traditionally the time when things start to go ‘a bit mad’. At time of writing it has already raised almost $1.85M, and has just clocked over 10,000 backers. The Titan ‘Typhon’ – an add-on, rather than included in the base pledge, but it’s HUGE (about 130mm tall), and looks gorgeous. The game is being produced as a joint venture by Mythic Games and Monolith Board Games. Monolith were the company who brought us the Conan board game – OK, this is not without its flaws, but was a fantastic example of a project giving Kickstarter backers a huge load of extras, including a very large amount of extra models, the vast majority of which are very good quality. Mythic Battles: Pantheon has been following this same example, and the basic $99 pledge now has well over 100 models – but these are not simply extra 28mm models, but rather include several rather large models of Greek Gods and other fantastical monsters. Whilst gamers may not be interested in the actual gameplay of Mythic Battles (though it sounds like a really nice game – and the beta rules are currently available to download from the KS site) for me this project is as much about the miniatures as the game itself. As the project has progressed and we’ve seen more and more models appear, I have been struck by just how many monsters from Greek mythology had made their way into our ‘general’ fantasy gaming – especially if you start looking at RPGs. 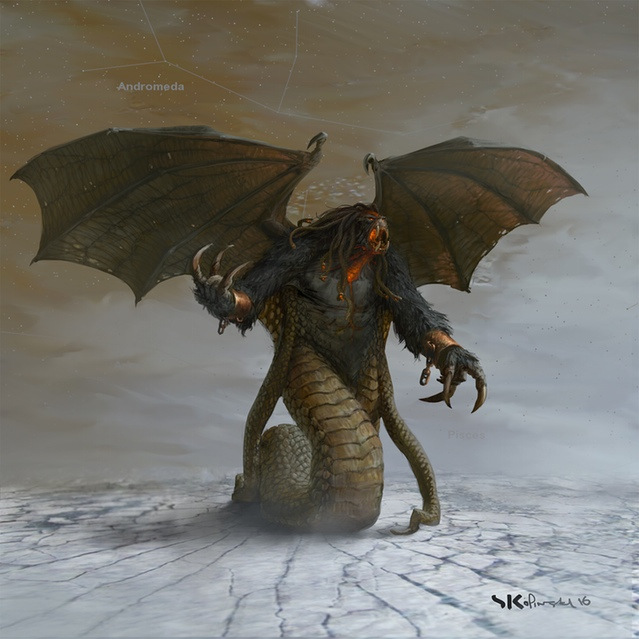 Whether it’s the Hydra, Medusa or Minatour, Chimera, Manticore or Harpy, our generic fantasy world is full of fantastical beasts that have their origins in the works of Homer, Euripides and Sophocles (to name a few). What I’m getting at is that this project may well have some fantastic models which may well be of interest to anyone who plays fantasy games, and not just boardgames players or lovers of ancient Greece. Also, if you don’t fancy the rules for Mythic Battles, you could always use these figures in another game – Of Gods and Mortals, a skirmish game from the pen of Andrea Sfiligoi, and published by Osprey Publishing, immediately springs to mind. It has a premise of Ancient Gods, monsters and heroes fighting alongside their mortal followers in battle. Whilst Mythis Battles does not have that many ‘standard’ troops available, add a plastic box set of Ancient Greeks from Victrix and you will have everything you need to play this game. Finally, it does look like there are going to be some very nice models produced – Monolith recently posted an update comparing the production plastic models with their resin masters, and the final models look great. If everything is up to this standard, there will be some seriously nice models to paint – especially the large God models (which are around 65mm-70mm tall, or sometimes bigger). Getting all the models in this project will not be cheap – Monolith are quoting around $398 + postage for the full set – but even the base pledge gives you some seriously nice stuff, even if the game itself doesn’t appeal. We discussed the game in some depth with Jake Thornton in episode 183 of the podcast. Mythic Battles: Pantheon is running until 8pm CET on Thursday 1st December 2016. Have a look – you may regret it otherwise…honest. Just to clarify – I’m not being sponsored or paid by Monolith or Mythic Battles, I’m simply a fan of this particular project spreading the word. Let’s face it, I don’t want the Luffmeister accusing me of making him miss out on a great KS because I failed to tell him about it…again. Have a look – your wallet may regret it…honest.